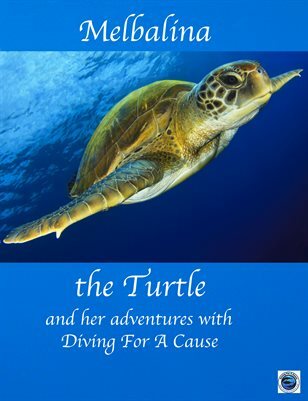 Melbalina the Turtle is our first Diving For A Cause story. It relects the adventures of Melbalina the Turtle, her friend George, Sammy the Sailfish and Marvin the Marlin. Beautiful underwater photos captured by well known videographer, Terry Maas, illustrate the fun-filled adventures of Melbalina and her friends! 28 pages of story fun, activity pages, drawing and writing! Fun for every child! Diving For A Cause story books is a new concept for DFAC that we created to share with all the children in the various communities we serve on our travels.The story book reflects our experiences in the ocean, as spearfishermen and videographers, and the beauty we observe on each single dive we take. Subsequent versions will include our travels with DFAC over the last 6 years, and printed in English and in Spanish.